The victorious Camp Retro team at the Brummitt. Photo: David Lowndes. 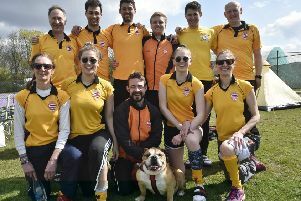 Camp Retro maintained their 100 per cent winning record in the Brummitt Mixed Hockey tournament at Bretton Gate over the weekend (April 8/9). A top-class side with a number of National League players of both sexes beat Ragamuffins A 3-1 in the final after two days of hockey played in sweltering temperatures. The Beavers team that won the Brummitt Plate. Photo: David Lowndes. It was a repeat of last year’s final with the same result. Camp Retro have only entered two Brummitts and they’ve now won them both. Emma Dalton shot Retro in front in the first-half of the final before Cameron Heald made it 2-0 early in the second half. Mel Ludlam pulled a goal back for Ragamuffins with 10 minutes to go, but a powerful strike from Chris Porter settled matters in favour of the favourites. Retro were almost knocked out in the Sunday group stages despite boasting a perfect record to that point. A goal difference problem meant they faced off against Jurassic Beavers in their final match needing to win to overtake their opponents and reach the final. Juarassic are grass pitch experts, but Retro had too much class and youthfulness and ran out 3-0 winners. Brummitt action from the Fairly Legal (white) v GPO match. Photo: David Lowndes. Beavers - a younger version - won the Plate Final for teams who finished in the bottom two of Saturday’s group matches 1-0 against Nottingham Trent University team Too Keen thanks to a late goal from Nathan Foad. Full results and round-up will be in Thursday’s (April 13) Peterborough Telegraph. Tha Fairly Legal team that competed in the Brummitt. Photo: David Lowndes.